Currently, only 34.4% of women in Europe are self-employed and only 6% own a business. That is considerably less than the male counterparts. New European – migrant – women often face cumulative barriers due to their cultural background. Concerned about the particular difficulties that these women encounter when starting or expanding their businesses, UNITEE has launched a series of conferences on the topic of strengthening women business leadership in the EU. Mr ASAN stressed the importance of gender inclusion for Turkey’s economic growth: “Turkey is expected to have the biggest growth among OECD countries by 2016. These ambitions cannot be reached if we leave the women behind.” Having conducted long-standing research in the area of migrant women entrepreneurship, Ms ESSERS highlighted the difficulties of being an entrepreneur, Muslim and woman, all at the same time. Along with Ms KIZILASLAN, she insisted on the necessity for women entrepreneurs to access finance, coaching and networking opportunities. Ms HUBERT introduced a policy perspective as she described how EU measures, such as the Strategy for Equality between Women and Men 2015-2020 and the Small Business Act of 2008, can enhance a paradigm shift towards a more equal and just Europe. 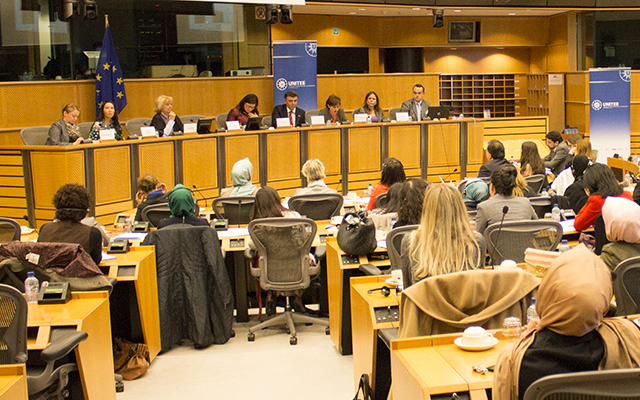 The event was not only an opportunity to take part of academic and political expertise in the area of women entrepreneurship, but a unique occasion to share personal experiences. Ms RENNICK told her inspiring story of how she created a social enterprise to help the poor of London. She convinced her audience that “if your heart is in it you can do anything”. Read the full report here and view our gallery here.